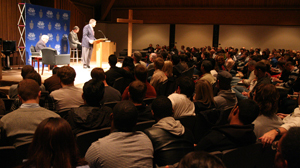 The Trinity Debates are a series of discussions on challenging issues related to the church, theology, and the Christian life. These conversations include presentations by experts followed by a time of open discussion. This debate series is intended to be a community resource that fosters deeper reflection and dialogue on difficult topics. 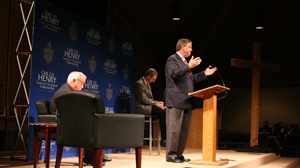 All Trinity Debates are free and open to the public. Come early for coffee and refreshments, and stay after for the Q&A. Our debates are also live-streamed at stream.tiu.edu. Chris Firestone is a Professor of Philosophy at Trinity International University. He came to Trinity with experience in teaching and research in Hong Kong and Scotland. At Trinity, he has worked at developing the “Trinity Debates” and the “Trinity in Romania” program (an annual apologetics and outreach trip for faculty and students). Dr. Firestone specializes in Kantian studies and has made significant contributions in the area of Kant’s religion. Is Social Justice an Essential Part of the Mission of the Church? Do relations of authority and submission exist eternally among the Persons of the Godhead?